Happy Birthday to the Church. While it can also be said that the Church came into being from the wounded side of Christ on the cross I like the idea of celebrating Pentecost as our birthday because that is when the whole reality of what Christ accomplished in His death and resurrection came alive not only in the apostles, but in all who were there and came to faith along with them. As I pointed out last week John has no Pentecost event. His presentation of Christ as the Risen One has Jesus appearing and conferring the Holy Spirit right away. For example, "Receive the Holy Spirit, whose sins you shall forgive they are forgiven them" Luke on the other hand unpacks the Easter gifts separately. The Ascension takes place 40 days after Easter, going along with Jesus 40 days of fasting and Israel's 40 years in the desert. Forty here is obviously a symbolic number. 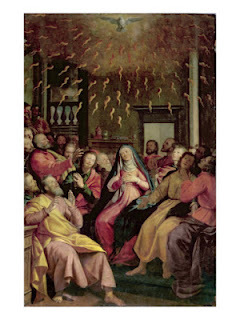 Pentecost, Greek for 50 days, is first of all the Jewish feast of Shavuot, 50 days after Passover. It is a celebration of the giving of the Torah to the people of Israel. Most of the first Christians were Jewish and so separating out the Resurrection, the return to God in glory (Ascension) and finally the giving of the Holy Spirit to the disciples and associating them with different days helped believers to more easily "unpack" the great mysteries of faith. So what does Pentecost mean for us? Is it merely a celebration of what happened back then? Certainly not. It is a celebration of what happens to us in our Baptism and Confirmation, and what continues to happen in us throughout our lives--God's Spirit, the Holy Spirit comes to dwell in us. We find this too good to be true. Sure, God can dwell in an Ark in the desert. God can become incarnate in Jesus. Jesus can be truly present in the Eucharistic bread and wine and in the tabernacle, but God present in me? In You? How can this be. We are weak, fragile human beings. We are not perfect, yet God's Spirit indeed dwells in us. When we let this really sink in we are transformed and the Lord can use us in wonderful ways. Many parishes are encouraging people to wear something red to church this Sunday. The priest has red vestments reminding us of the tongues of fire which descended on the apostles. By wearing red we acknowledge that while there may not have been tongues of fire at our Confirmation the Holy Spirit did indeed come to dwell with us. At Easter and Christmas families gather at home to celebrate a big meal. Perhaps we should have a big Pentecost dinner or a special outdoor barbecue to celebrate this great feast. So Happy Pentecost and Happy Birthday to the Church, the entire Christian community. And to our Jewish friends a Happy Shavuot. The Feast of the Ascension--What Does It Mean for Us?? We are nearing the end of the Easter season and are celebrating several feasts which each in their own way help us to open up the Easter mystery more fully. 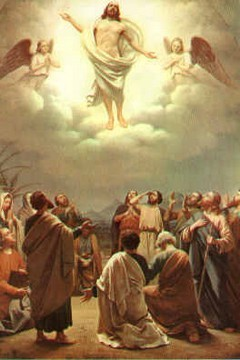 This week I would like to focus on the Ascension. Those in the northeast U.S. celebrated this feast on its traditional day--Thursday. In most of the world it is now celebrated on the seventh Sunday of Easter. Some have asked, "How can Ascension Thursday be on a Sunday?" This is an understandable question. A little Scripture reflection is in order. The Church's liturgical cycle is based on Luke's Gospel and the Acts of the Apostles (both written by the same author) which has the Ascension forty days after Easter and the Descent of the Holy Spirit on the Jewish feast of Pentecost (50 days after Passover.) The Church was just beginning to develop a liturgical calendar and this was a good thing to do. In Matthew and Mark the Ascension is simply mentioned with no time line and in John Jesus is risen, glorified and sending the Spirit all at once. In other words we don't really know exactly when these events took place. What is important is their meaning for us. Unfortunately I think that most Catholics accept that Jesus ascended to heaven after appearing as the Risen One but don't get what it has to do with us. Also with our present understanding of the universe it is a stretch to believe that the Ascension was as pictured in the image I have attached to this blog entry, going to someplace "up there". What we celebrate with this feast is that Jesus' earthly mission was finished after appearing to his disciples and commissioning them to preach the Gospel. He returns to the Father so that he can work in and through all of us. We are all commissioned to preach the Gospel. This is really a feast of evangelization. The great challenge of the Ascension can be found in the words that the men in white garments speak to the disciples in the feast's first reading in Acts 1:11--"Men of Galilee, why are you standing there looking up at the sky?" In other words our goal indeed is heaven, but there is work to do here on earth. They then are promised the gift of the Spirit which will help them (and us) to do that work. And what is the Spirit's role? That will be my next reflection for Pentecost. As most of my blog readers know the Vatican recently came down hard on the LCWR (Leadership Conference of Women Religious). 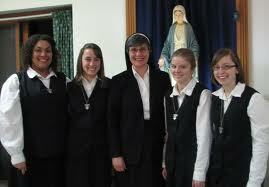 This group represents roughly 80% of the sisters in the USA. They cited doctrinal and other concerns. I was upset by this and it has taken time for me to understand just why I was upset. I have signed two statements that have circulated in support of the sisters. Before writing here I wanted to go beyond merely being anglry and to say something constructive. Ask yourself, "Do I know any sisters? What are they doing?" Obviously there are fewer of them than there were forty years ago. While many of them are still involved in education or hospital administration they have branched out into other directions. I am close to three sisters from different communities who are in parish ministry. They do everything a priest does except for celebrating the Sacraments. They are well-respected and appreciated for bringing a feminine perspective to parish ministry. Others are spiritual directors. They are well trained and sought after for this important service. Still others are working with the poor, with victims of aids, in prisons, in shelters for the homeless. Others minister to battered women and children. The list goes on. They are prayerful, hard-working women. So why this decision to order the conference to re-organize? I just finished attending a three day fraternal gathering with some friars of my province. These are sessions where our provincial leaders meet with groups of friars to talk about our life. One thing we discussed was the importance of walking with and accompanying our people as brothers. This comes first before preaching and teaching. We can't preach and teach if we do not know the experience of the people we serve. We need to listen to their stories. It seems to me that most of the sisters do this very well and that is the basis for many of their positions which concern the folks in the Vatican. It also seems to me that the highest levels of leadership in the Church do not walk with and accompany those the serve. The issue decrees and mete out punishment first. To be fair they may be some areas of concern, some out of line things that have gone on, but most of the sisters are not guilty of these things. Perhaps if the people in the Vatican had called the president of LCWR and said, "Let's talk. Let's hear what you are doing these days. Tell us your stories," things might have been different. I try to keep this blog positive. I don't want it to be a protest forum but I felt that this needed to be said. To end on a positive note please approach any sister that you may know and say, "Thank You!" I've been at home in St. Anthony Friary for several weeks. I've accomplished a lot from finishing my book (waiting to hear from the publisher) to giving my room a real spring cleaning. I'm now looking forward to summer. Every year I head for Eagle River, Wisconsin and I'm looking forward to arriving there in June. 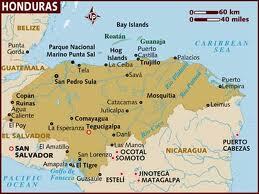 Before Eagle River, however, there is another journey to make--to Trujillo, Honduras from June 8-17.
for that parish's annual June mission trip to the diocese of Trujillo, Honduras. 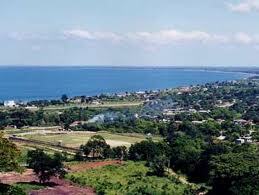 I gladly accepted and will be going to Little Rock to fly down with the other members of the mission team. There is some small amount of trepidation (the usual stuff that you might imagine) along with my enthusiasm. I ask for your prayers not only for myself but for the wonderful people that I will be with. The mission includes not only an evangelization team which I will be a part of, but also doctors, dentists, nurses and others who will be sharing their skills. I got to meet some of them along with Bishop Sole' ,bishop of Trujillo in February after I preached a retreat to the Knights of Columbus of Arkansas and their wives. That meeting added to my enthusiasm. As I've thought about preparing for this great opportunity I've given some thought about what this trip might mean. I've wondered what I might bring to the experience but as I have continued pondering that question I've also begun to ask, "What gifts might the people of Honduras have waiting for me?" With that in mind my thoughts went to a homily given by my confrere, Dan Lanahan, OFM during his recent stay at our friary. He talked about the importance of receiving as an aspect of love. Receiving is different than taking. Taking includes a sense of entitlement. Receiving means being open to the gift that another has to give, or even asking another for help. He pointed out that we usually ask for help from people that we trust and care for. In thinking about Honduras I have been praying that I will not only share with the people there whatever gifts that I might have but also that I will be open to the gifts that they have for me. It is so easy for us Americans to think in terms of what we have to bring to people from a poorer country, and indeed we have much to give. At the same time I am going with an open mind and heart to be ready to receive the gifts of the people there. Once again please pray for all of us. I will let you know about the experience after I return.